Wherein The Rookie makes her first pot roast. In case you are wondering if I am really a rookie in the kitchen, consider this: I am fifty years old and have never made a pot roast. So when St. Patrick's Day arrived, I found myself staring at a chunk of corned beef in the grocery store and realized my opportunity was at hand. I grabbed a head of cabbage and the beef and went home planning to figure it out. Not coincidentally, a few days previously on the Food Network I had seen a woman in Ireland demonstrate how to make colcannon. 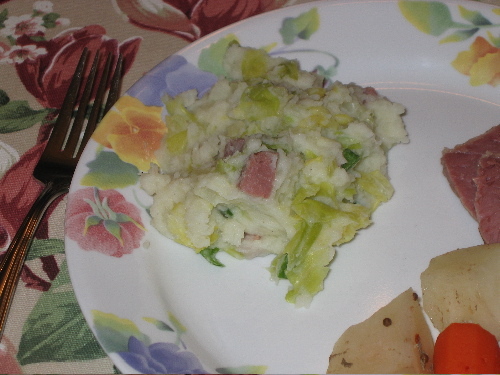 Colcanon is a traditional Irish meal which is a variation on mashed potatoes, and includes cabbage and boiled ham all in one hearty dish. I decided to make the colcannon with the corned beef. What made the colcannon interesting was the fact that the potatoes are steamed, not boiled, and the jackets are easily removed with a knife after cooking. Steaming the potatoes seems to make the texture less water-logged and more even. After the potatoes are mashed with warm milk and butter, the recipe also calls for boiled ham which is then shredded and folded into the mash. In our house we used turkey ham, which may have altered the texture somewhat. Finally the cabbage, which had also been boiled, drained and chopped, was added. The corned beef was cooked in the usual manner, that is covered in water and simmered for several hours. I used the crock pot (set on high) for mine and it came out just fine. Now I know why pot roasts are so easy, and I look forward to trying it again with a different type of meat . I am not a huge fan of corned beef but I'll eat it for the sake of tradition and to try something new. The colcannon, on the other hand, was delicious and soul-soothing. Note to self: Next year, skip the big chunk of corned beef and buy a sandwich or a few slices at the deli if I need to honor tradition. But be sure to make the colcannon again!